I had never been to New Orleans but had heard plenty about the city and the food that it’s known for. My parents were going for a weekend and luckily I didn’t have to crash their trip as they were kind enough to invite me along. So I did my research and gathered recommendations from friends and I joined them for a few days, filled with beignets, etouffée, gumbo and lots of other Cajun cuisine. Yes, I only listed food because as usual that’s mostly what we did. Well, that, and exploring the city. One of my friends told me that when you go to New Orleans it doesn’t feel like you are in the United States and I didn’t really understand that until I was there. It is such a unique city, rich in history and rich in traditions, so much so that you can see the influences of French and African culture all over. I had never been to any other US city where a major street will be closed down in the middle of the day for a block party during the week. I’ve read so much about New Orleans cuisine and had variations of it but there really is nothing like trying a well made dish for yourself in the city where it originated in. This is especially true when it comes to inspiration for my recipes. It is hard for me to write a recipe for something like etouffée when I have only read about it. No trip to New Orleans is complete without at least one trip down Bourbon Street – while touristy and wild, it’s also one of the most historical parts of the city. It’s filled with live jazz music, bars and restaurants. Some of them have become institutions; they have been around for so long. While on bourbon street, you have to get a "hurricane", one of many popular drinks served in New Orleans. It’s a cocktail made with rum, orange juice, passion fruit juice, lime and grenadine. To fully experience New Orleans, one has to eat at some of its unique restaurants and of course there are hundreds to choose from. My parents and I tried for variety - and I think that we achieved that goal. Here are some of the restaurants where we dined - and a brief description of what we ate. My flight landed at 6pm Thursday night and I was all ready to eat. Earlier that morning I made a reservation at Cochon, a restaurant known for southern cuisine, especially their pork dishes (hence the name cochon - or pig in French). Chef Donald Link earned a James Beard Award for his work in 2007 for Best Chef South, the same year that Cochon was nominated for best new restaurant. The rustic restaurant is located in a renovated warehouse on Tchoupitoulas Street. I swear the locals named the street that just to stump tourists – try saying that five times fast (or pronouncing it at all). Feeling adventurous, we ordered the fried alligator with chili garlic mayonnaise and while this sounds like a cliché the meat did taste similar to chicken. The breading was crisp and not too heavy and the sauce added just the right kick. We also went with the wood-fired oysters with chili garlic butter, which surpassed my expectations. I am an oyster fan but I had never had them wood-fired. They were tender and the lemon squeezed over top enhanced all of the flavors in the chili garlic butter. The boudin balls were similar to arancini, consisting of a mix of Cajun sausage and rice, battered and deep-fried. Boudin sausage is a mix of pork shoulder, pork liver and spices and instead of stuffing the sausage mix into casings for traditional boudin, it’s mixed with the rice and then fried. For our entrées we shared the smoked ham hock (the end of the shank from the pig leg) with pinto beans, apples, sage and jalapeno buttermilk as well as the Louisiana cochon with cabbage, cracklins and pickled peaches. Friday morning my mom and I headed to the iconic Café du Monde, for beignets and chicory coffee. Similar to donuts, beignets are deep fried squares of choux pastry that are served covered in a thick layer of powdered sugar, and I mean THICK. They are denser than donuts but no less addicting. Word to the wise: don’t wear black clothes, as you will end up covered in a dusting of powdered sugar all over you. Their coffee is served either black or with milk (café au lait) – the addition of chicory adds flavor similar to hazelnut and in the past had been used as an alternative to coffee when supplies were short. New Orleans, a city known for their traditions, still serves coffee with the addition of chicory. If you are headed there and think you will be able to get anything other than beignets and coffee you are mistaken. The café started as a small stand in the New Orleans French Market in 1862 and has continued to serve their limited menu, not like you would want to order anything else! Café du Monde is open 24 hours a day but if you want to get a seat without waiting in a long line, definitely show up early in the morning. Tip: dip the beignets in the chicory coffee, since they are so dense it holds up in the coffee and adds great flavor (plus the powdered sugar from the beignets sweetens the coffee). I wanted to try an authentic po’boy so I headed to Mother’s restaurant, a cafeteria-style institution that has been around since 1938. It amazed me how many restaurants had been around for what seemed like forever, especially when in Los Angeles, a restaurant being around forever is like 10 years. I figured that a sandwich would be about 6” and I was pretty hungry so my mom and I each got a full sandwich… oops. We ended up with two, foot-long po’boys – needless to say we over-ordered. Luckily my dad enjoyed the leftovers when we brought them back to the hotel. I learned that a whole sandwich in New Orleans is huge so you typically only need a half sandwich to be content. My mom is the best and let me choose what she was going to eat based off of what I wanted to try (and photograph). We went with a shrimp and oyster po’boy and the “Famous Fredi special”, a sandwich served on French bread with ham, roast beef, au jus gravy and “debris” – the pieces of the freshly shaved roast beef that fall into the pan when carving, a term they coined at Mother’s. This cute little restaurant on Magazine Street was previously a grocery store and a flower shop dating back to 1908. The restaurant pays homage to old New Orleans with the historical building and serves classic Creole dishes with an innovative twist. Once again we ordered a lot of different dishes to get a little taste of everything on the menu. While everything was delicious the standouts to me were the blue crab beignets, the ricotta dumplings and the turtle bolognese. The blue crab beignets were served with a malt vinegar aioli and were so good we had to have another order. The outside of the beignet was fried to a perfect golden brown and the inside was a light and creamy mix of crab and almost a béchamel. We also ordered the ricotta dumplings, which my dad described as “delicious little clouds”. They were impossibly light and were served with a simple sauce of roasted cherry tomatoes. I had wanted to try something with turtle as a main ingredient because I had never had it before and I know it’s a “Southern thing”. I had heard good things about turtle soup so I opted for the turtle Bolognese as my entrée. It came tossed with bucatini pasta (my favorite) and topped with a fried, soft-boiled egg and a bit of sherry. The runny yolk was so velvety and rich over the pasta; I was full but couldn’t stop eating. This Italian grocery on Decatur Street in the French quarter is known for their muffaletta sandwich. Remember how I mentioned I over-ordered with every sandwich I had? Yeah – this one was no different. 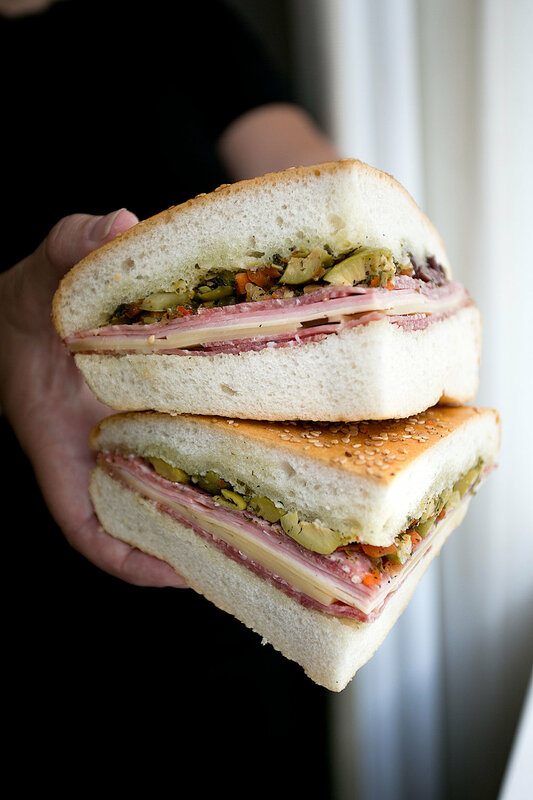 A whole muffaletta is essentially a whole round loaf of bread cut into quarters. The sandwich is similar to an Italian sub and is served on Sicilian sesame bread and filled with layers of ham, salami, provolone and a marinated olive salad. The grocery store itself sold all the fresh pastas and high-quality olive oil you could want – I instantly regretted only bringing a carry-on suitcase. Pralines are a confection common in New Orleans made from sugar, cream and nuts, typically pecans. The mixture is boiled until it becomes creamy and caramelized, the mixture is then spread out into cookie-like pieces and dries to an almost fudge-like texture. The treat was adapted from a French recipe that used almonds in favor of pecans, a nut that was readily available in New Orleans. Aunt’s Sally’s is one of the famous shops selling the candy – my favorite was the one with the bananas foster flavor. It really tasted like you were eating a whole banana’s foster. I of course brought some back with me and have been eating them for a nightly dessert! One of our Uber drivers told us about PJ’s – a local coffee chain. Instead of getting our usual Starbucks order we opted to try PJ’s coffee. I love that they serve coffee that is 2/3 less acidic than standard coffee, a good selling point. I tried a caramel granita, which ended up being a little sweet for that early in the morning but would have made a perfect afternoon-pick-me-up. I liked how the ice was shaved - it was a great consistency! As the plane lifted off on Sunday morning for my return to LA, I thought about the past few days. Not only did I have a great weekend with my parents, I had experienced one of the great "food eating" cities of America. I will definitely be returning in the near future.